Make your own sauce first, its healthier! 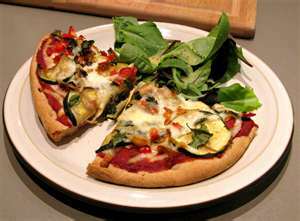 any veggie toppings you desire, such as onions, mushrooms, bell peppers, etc. In a blender, mix the tomatoes, garlic and onion. In a medium sauce pan heat oil and add mixture. Wait until it bubbles and add the seasoning and tomato paste. Stir well. Add about 1/2c water and bring to a boil and then back down to a simmer for about an hour. On an oven baking dish or pizza rack, flatten out your pita or tortilla bread. Generously spread your homemade sauce, sprink some cheese (the more cheese the tastier but also more fattening! ), and then your veggies. You can also do a layer of cheese, a layer of veggies and then another layer of cheese. Bake in a preheated oven at 350 degrees for about 15 minutes. PS: Ive made my own crust using Flechman’s yeast using whole wheat flour and it also came out wonderful, but a bit time consuming. If youre interested in that, go for it, the direction of how to make the pizza crust is on the yeast package.